How do I install SQL-RD? This is a step by step installation process for SQL-RD. Before beginning the installation, please ensure that ALL of the prerequisites listed on the SQL-RD Prerequisites page have been met. This ensures that SQL-RD runs as expected. Failure to meet the listed prerequisites may result in errors occurring. Except for trial users, Installation and Configuration of SQL-RD on a new server are not part of normal technical support. If assistance is needed or requested during the SQL-RD installation or configuration process, Professional Services can help for a nominal consultation fee. A reboot of the SQL-RD server will be required after installation is complete. 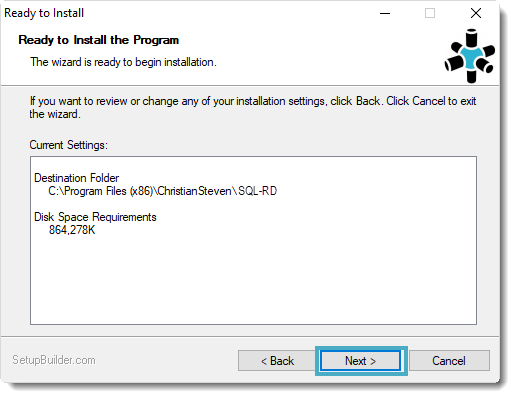 These steps must be completed prior to running the SQL-RD installer. If you are installing SQL-RD for the first time on this server, turn off the User Account Control (UAC). 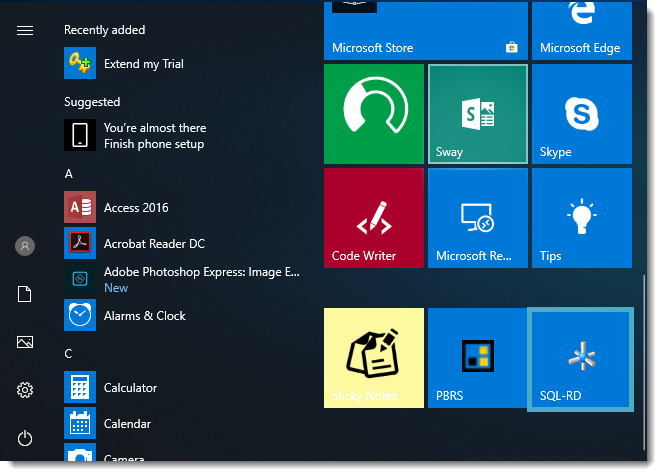 You can turn it back on once the installation of SQL-RD has completed. 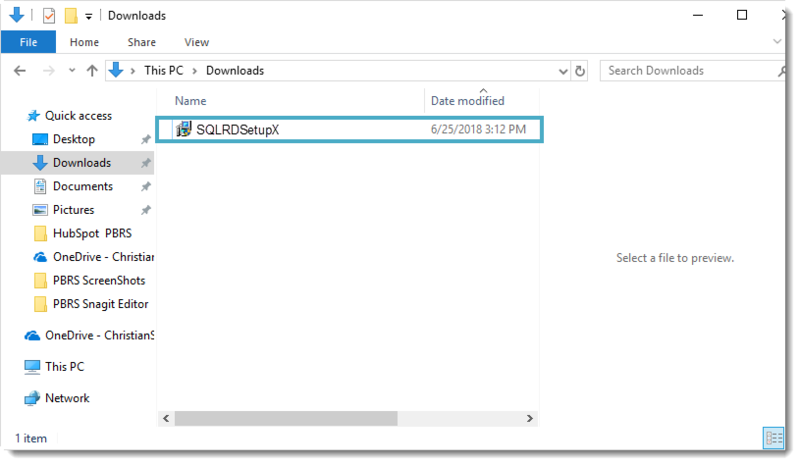 Open the appropriate SQL-RD version/build folder. This is most likely located in your Downloads folder. 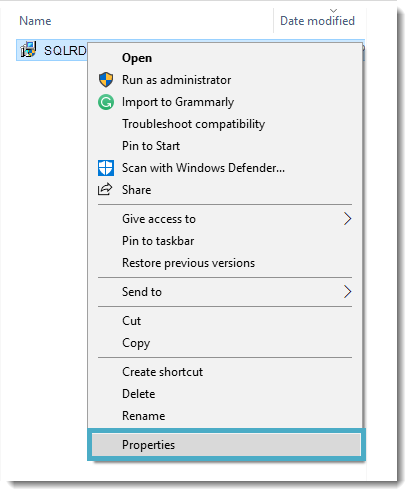 Highlight and then right-click the SQLRDSetup file. On the General tab, click Unblock in the lower right corner. If Unblock is not present, the SQL-RD installer is already unblocked. Some security features, such as Windows SmartScreen, can block certain files or flag them as potentially unwanted. If the SQL-RD installer is run without being unblocked, SQL-RD will not run properly. On the Properties window for the SQLRDSetupX that you opened in the previous step, click the Compatibility tab. 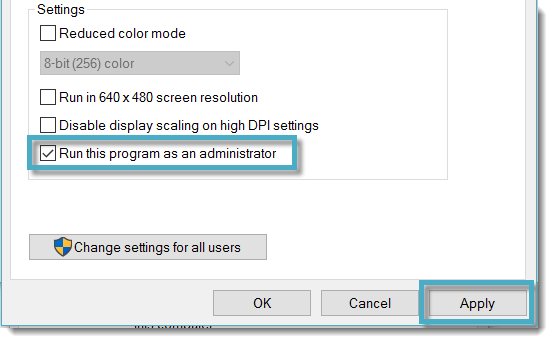 In the Settings section at the bottom of the window, ensure that Run this program as an administrator has a check next to it. If it does not, check it. Click the Apply and OK.
You must perform this step even if you are logged in as an Administrator or have Administrative rights on this computer. 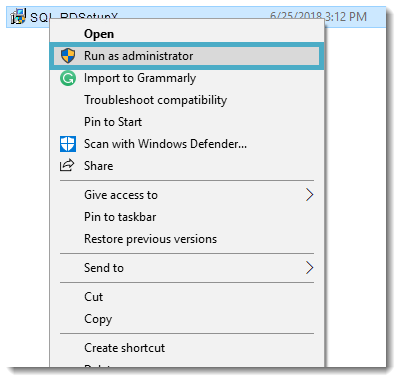 Right-click the SQLRDSetupX and select Run as Administrator. Click on the Yes on the Install Core PreRequisite? pop-up window. Click Next on the Welcome message. Carefully read the License Agreement. 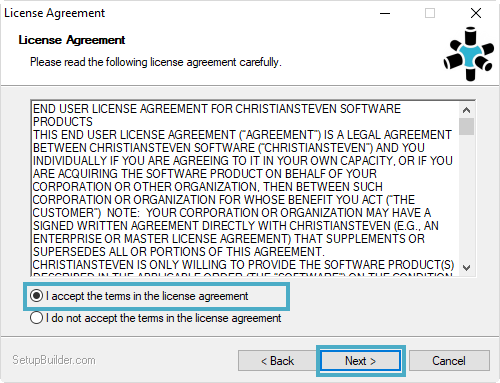 Once you have fully read and understand the License Agreement, click the radio button next to I accept the terms in the license agreement. Then, click Next. If you do not accept the terms of the license agreement, you will not be able to proceed with the installation. Now, you will see the Select Destination Folder screen. You can choose to leave the default destination folder that is currently listed or select your own. Click Next. Leaving the default destination as the destination folder is recommended. 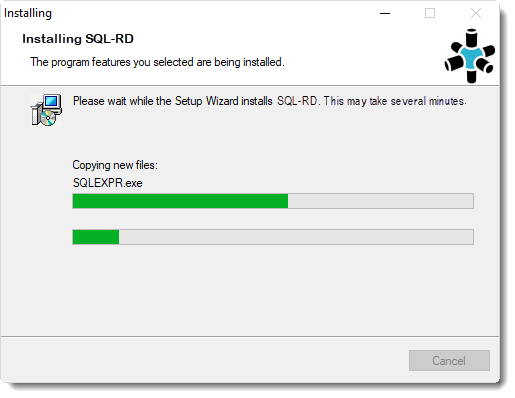 You should now see a Ready to Install window detailing the current settings for the SQL-RD installation. 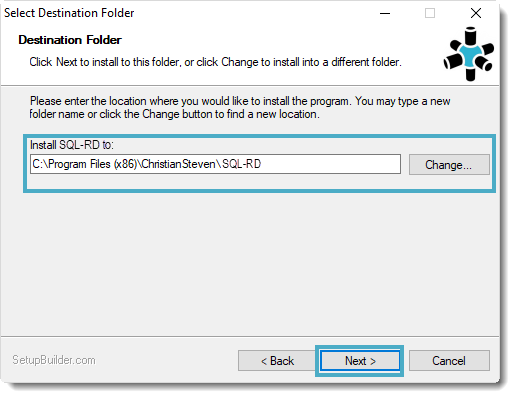 These details include the destination folder you chose in Step 10, as well as the Disk Space Requirements for the SQL-RD installation. Allow the SQL-RD installation to complete. You do not need to click anything during this process. When the Setup Wizard Complete screen appears, click Finish. At this time, you may see a pop-up stating that you will need to restart your computer in order to complete the SQL-RD installation. Click OK.
Should you not receive this message (below) you will need to manually reboot the server at this time. SQL-RD is now successfully installed on this server. The first time you open SQL-RD, you will need to configure the SQL-RD database. This is where SQL-RD will store the information regarding the schedules you set up within the software. 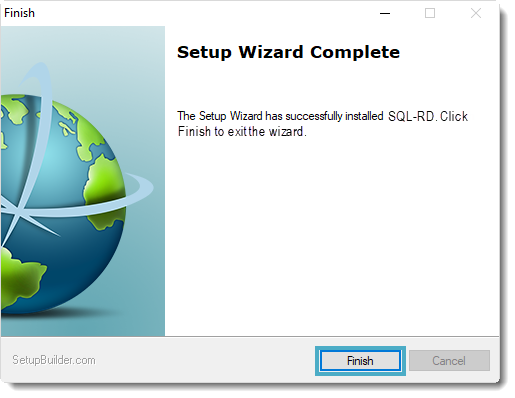 Select how you want to install the SQL-RD database to proceed with the database installation steps. 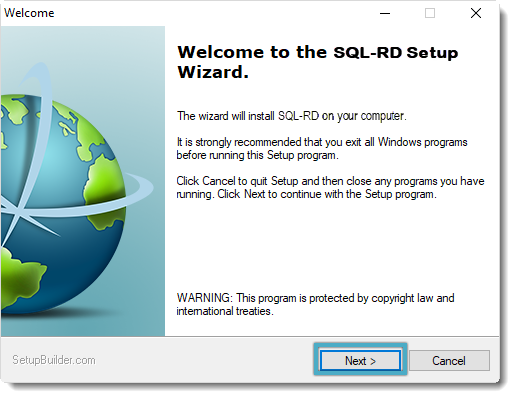 Option 1: Default SQL-RD Database Installation. Option 2: Use my existing database server.